Lying close to the Swiss border, this snow sure resort boasts an extensive, modern ski area whilst retaining the traditional character of its original three villages. Granted duty free status in Napoleonic times, today's flourishing resort offers a wealth of winter entertainment and fantastic shopping. The bustling traffic-free centre offers good value stores and designer boutiques alongside a variety of vibrant cafes. Rustic bars and good restaurants provide après ski options. Husky sledding, snowshoe walking and horse riding are just some of the non-ski activities available, the impressive Aquagranda Spa centre and local creamery are well worth a visit. Free ski hosting with your Inghams Rep.
Arguably the best hotel in Livigno, this luxurious hotel benefits from a ski back location and quick access to the slopes. Boasting superb facilities including indoor pool and an expansive wellness area, this upscale hotel makes for a relaxing choice. Modern and stylish hotel offering high levels of comfort in a ski back position. Opposite the aptly named 'Amerikan' lift which connects to the Carosello gondola. A classic alpine hotel which has been welcoming guests for over 100 years. In a great location, just 200m from the lifts and 300m from the centre of resort. Recently refurbished, contemporary hotel in a panoramic location, a short distance (200m) from the nearest chairlift. Hotel Alexander boasts an impressive spa with a high standard of accommodation. 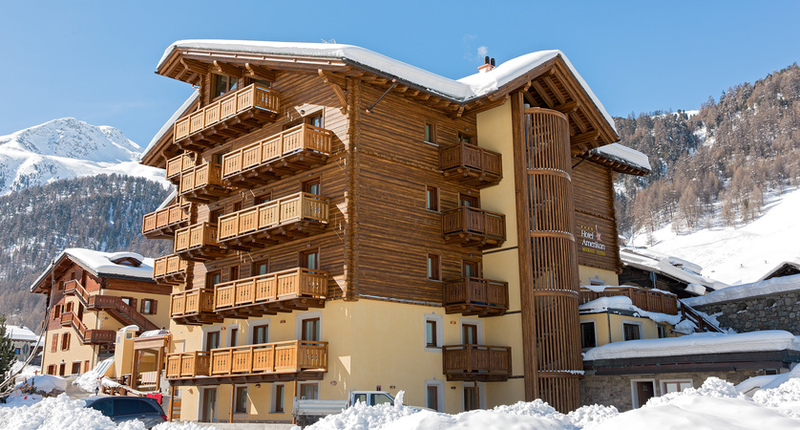 Conveniently located just 250m from the lifts and Mottolino ski area. With superb views over the valley, the Intermonti has been a popular choice for the British skier for many years. Modern, quality hotel in a convenient location for both the lifts and resort centre - just 250m from the Cassana lift and 350m from the heart of Livigno. This superior hotel enjoys an enviable position right in the heart of the resort and only 200m to the nearest lift. Its stylish and modern interior gives it a vibrant atmosphere, with a focus on great food and an excellent range of spa facilities. Family-run hotel offering excellent value in and enviable position in the heart of Livigno, 250m from the nearest lift. Free resort bus stops 20m away. The comfortable Al Gal apartments are situated within recently built chalets and sleep from 2 to 6 people. Tuition starts on Sun. 11am-1pm daily. *6 day snowboard tuition is for beginners only. Other abilities may choose 4 day option which also starts on Sun. †Child snowboard tuition starts from 8yrs.